Today when we opened the blinds the sky was blue (well actually it was dark at 6am but it got better) so I decided to get out for a walk with Baby B. Last week I wrote about ideas for entertaining a toddler and one of them was getting out and about more. We don’t have a car so I had a quick look on Google Maps to see what was within easy reach on public transport. 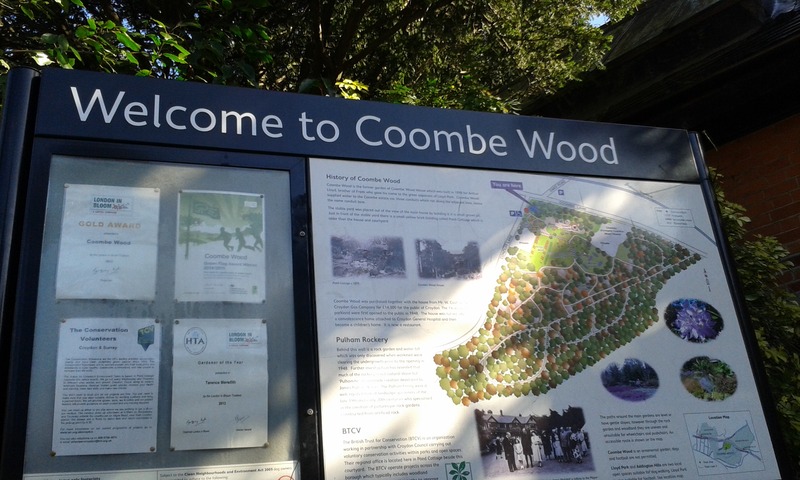 We’re lucky to have pretty good transport links where we live in south London and I noticed a nice looking spot of green with a cafe called Coombe Woods. So once breakfast was over and Baby B had had a VERY SHORT NAP we set off. I diligently went through my checklist for his bag – nappies (especially as he’d had two explosive poos this morning), change of clothes (ditto), snacks, water, soothers, wipes, Penguin. That’s a standard baby bag right? Off we went on the train and then changed to the tram. It was only three stops and the urban sprawl quickly receded. Having lived for fifteen years in inner-ish London we’d been nervous about moving further out but being able to get out of the city so easily is a bonus. I think we will probably have to get a car soon so we can make the most of it. For now it was uplifting to be able to look back at the buildings we’d been amongst only twenty minutes earlier. B was in a funny mood. No smiles today. I think he is still getting used to his new routine of being with our childminder Tuesday to Thursday. He gets a lot of stimulation and his naps aren’t quite as good. Also, it means he’s with someone different for three days and then it’s suddenly Daddy Friday and it’s probably very confusing for his not even one year old head. Anyway, it was a ten minute walk along a not too busy road to get to Coombe Woods. The atmosphere changes so markedly as soon as you leave London. It’s not as if we were in the wilderness but there is such a contrast in noise, air quality and light. The Coach House Cafe was busier than I’d expected, which was good as I’d been a bit worried we’d be the only ones there. The staff were friendly and helped with getting a high chair. Baby B got some compliments and managed to give his public a smile. Cheeky sod – still none for me! Coffee and Kentish Apple cake for me, raisins and water for Baby B. He chilled out and took in his surroundings. After the thrills of the cafe (yeah, yeah, bit desperate I know) we went for a short walk in the gardens. Spring was definitely in the air today; snowdrops carpeted the ground and the borders looked almost ready to burst into life. I love this time of year after the dark and cold, don’t we all! And now Spring has more significance because it’s when we became parents. The change in the seasons brought back some memories of last year and how nervous and excited we were. It’s only a couple of weeks until his birthday now. It’s a cliché but it has flown by. Although I do find that when I think back to anytime BB (Before Baby) it feels like I’m looking back across a vast canyon that separates that life from now. Before I got too deep Baby B did a massive fart so I decided it was time to start heading home for lunch. Today felt like a brief foray, a scouting mission, into my local surroundings. We’ve been here for eighteen months but have barely explored beyond our immediate locale. Looking at the map I can see a lot of interesting spots that I want to visit; we need to start making the most of our National Trust memberships (I can admit to this now I’m middle-aged!) Time to start looking at second-hand cars I think! What are you looking forward to now Spring is almost here? Any days out you’d recommend?